The flight from London Gatwick airport to Cancun went surprisingly smoothly. For a UK-originating long-haul flight, the Thomson transfer was also pleasantly punctual. We touched down almost dot-to-dot on schedule. Believe it or not, those 11 hours were my longest-haul uninterrupted flight EVER. I was finally in Mexico! After being stripped of my emergency supply of imported apples by the Mexican customs (bringing fruit into Mexico is not allowed), I exited into the carefully administered mess that was the arrivals hall. Hundreds of people holding up shields sporting the name of every holiday operator you can think of eventually revealed the narrow passage leading outside – where taxi and shuttle bus drivers took over the delicate job of making themselves heard by the rest of the world. I was the sole carrier of a backpack as far as I could see. 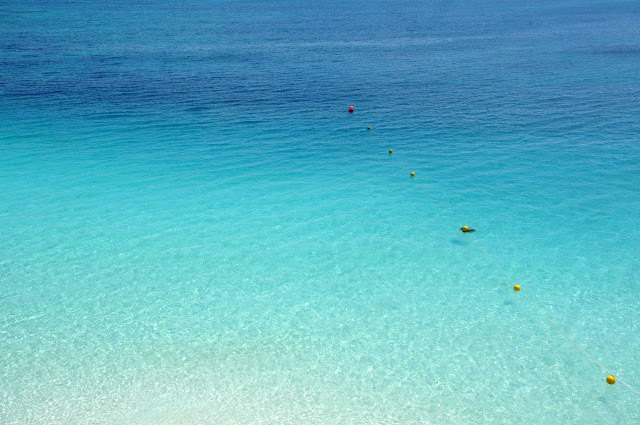 Most people had come to Cancun for a more relaxed type of a holiday. 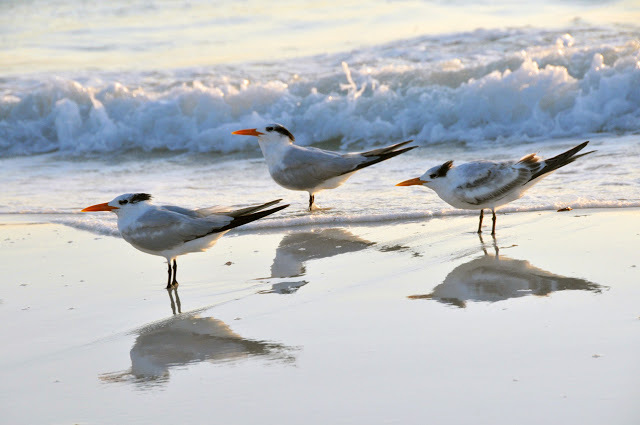 The connections from the airport to Cancun were plentiful, but I was really after Playa del Carmen – to continue to my overnight point, Tulum. I finally found the right ADO (first-class bus services in Mexico) bus, reached Playa del Carmen and caught a local Mayab bus to Tulum. If the former bus had a mere handful of locals in it, the latter definitely impressed: I was the only foreigner on board. 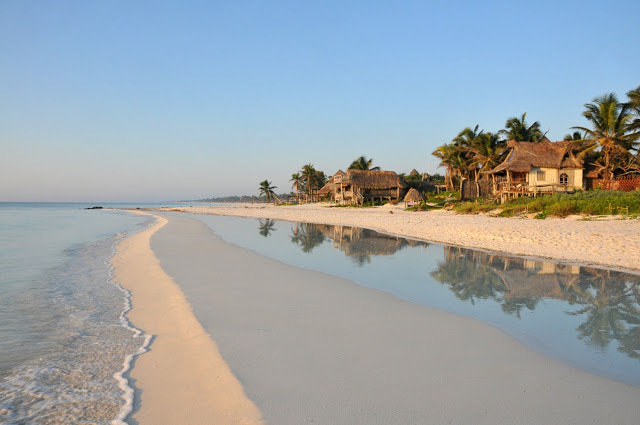 Tulum looked like the right choice of a destination. 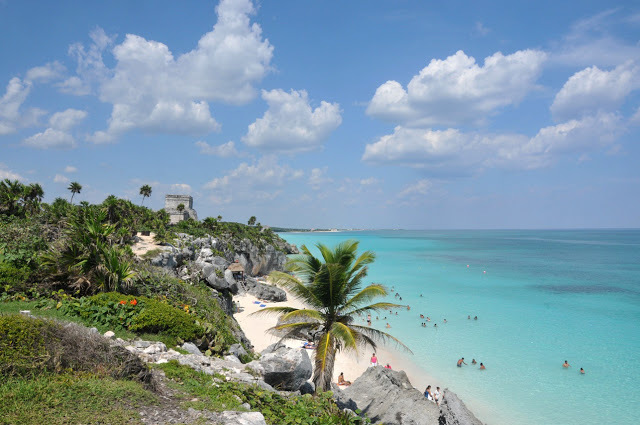 Tulum is split between the downtown, or pueblo (surrounding Highway 307 running from Cancun south to Chiapas) and the coastal area (housing the city’s beachside hotels, themselves ranging from simple B&Bs to luxury resorts) some 5 km from central Tulum. I had better forget about any sort of luxury on a backpacking holiday. 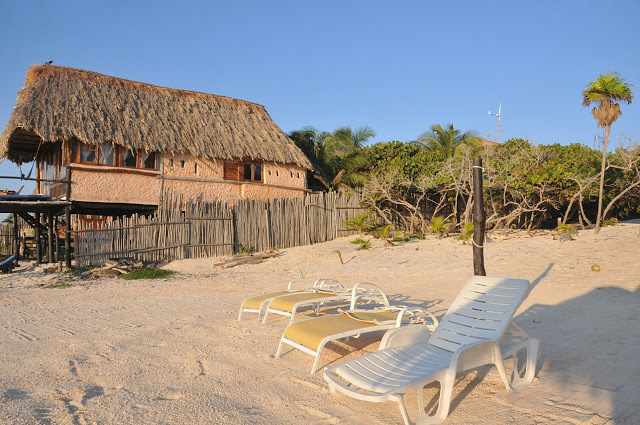 Even simple accommodation in Tulum was decidedly not cheap though. I had eventually settled for a small beachside hotel called Playa Kin Ha, which looked simple enough not to scare backpackers away – and expensive enough to preserve some kind of exclusivity. Oh, and it boasted some good Tripadvisor publicity, too. What do you mean no electricity? The first examination of the room left me unconvinced. Yes, the sea was right there, a mere 50 meters from the hotel and making a wonderful view from my balcony. But what about the electric sockets? I had moved every piece of furniture away from the wall, and there was still no sight of a power source. Was it done on purpose? A quick internet inquiry on my blackberry gave some comfort. 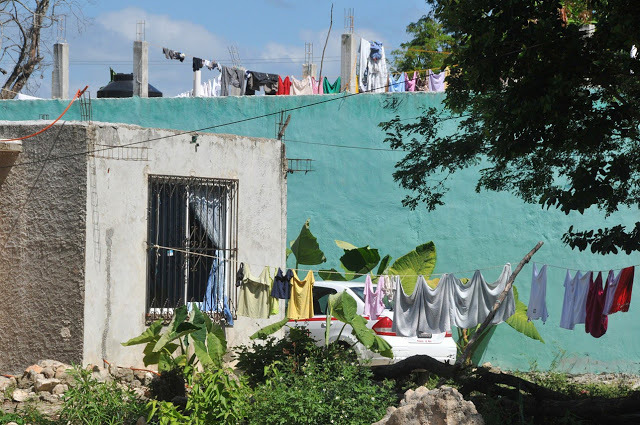 The coastal areas of Tulum do not have a permanent source of electricity and rely on a combination of solar panels, household-size wind turbines and diesel fuel to light their bulbs. Some hotels do not even have electricity or hot water for most of the day. Mine did, but individual sockets in guest rooms was probably asking for too much in life. There were two sockets at an open air bar downstairs, I had been told. I was welcome to leave my blackberry to charge there overnight. I politely declined. Somehow the idea of my blackberry alone in the dark in the middle of nowhere on the Caribbean coast did not sound like a particularly good one. Isn’t it amazing how little we sometimes appreciate the small conveniences in life? Like sockets in our rooms, for example. 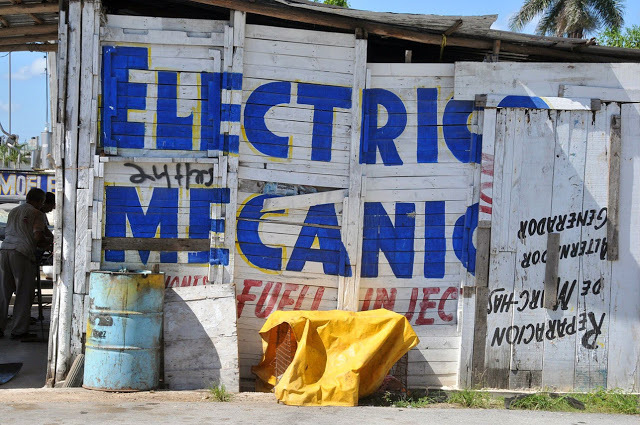 Electric matters aside though. 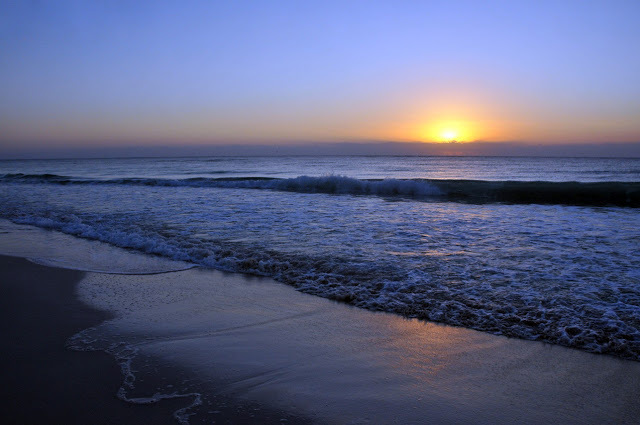 In front of me stretched the most glorious sunset-lit Caribbean beach – white sand, seashells, perfectly blue waters and all. I did not need an extra invitation and ran into the sea. But it wasn’t really my day. Within the first ten minutes in the water, a hair got caught around my arm. Or was it actually a hair? I suddenly felt my left arm burning in pain. The “hair” was an aggressive one and soon attacked my right arm and stomach, too. It was one stinging little monster! It took me some time to get rid of it and swim back to the darkening shore. So much for my first ever Caribbean dip. Watching the burnt patches of my body covering in red and white bubbles, I logged back into the internet to search for the mysterious stinging species. Google’s top result for my desperate keywords sent shivers down my spine. Stingray!? Had it been a stingray, I would not have been writing this blog. Sea lice were the next option. Those don’t come as threads or hair, though. I gave up. The bubbles slowly started to even out. Heaven knows what stung me that night; I may never find out. I was the only person staying at Playa Kin Ha the first night. My first conversationalist in the morning was Tomas, the hotel cleaner and night guard. He spoke no English, and I had forgotten most of the Spanish I used to know. 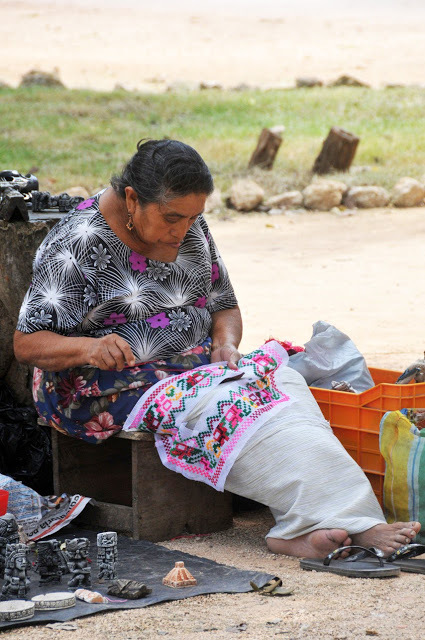 After involving some heavy body language, I established that Tomas came from the state of Chiapas, did not have a family and was living in Tulum’s pueblo. I am not sure if he understood any of the details about me I tried to convey to him. In any case, he nodded patiently as I stumbled across my long-forgotten Spanish vocabulary and hopeless grammar. Importantly, I found out that the hotel next door had bicycles to rent. A bicycle was a good way to get from the beachside area to the pueblo, and I promptly rented one for the day. My first (and rather unglamorous) stop was the San Francisco supermarket. The latter was marked by a massive Mexican flag above the check-outs. I finally believed I was really in Mexico! After filling my backpack with fresh papaya, avocado and local bananas (I was going to take full advantage of my Caribbean paradise), I cycled a few kilometres along the coast to the Tulum archaeological zone. 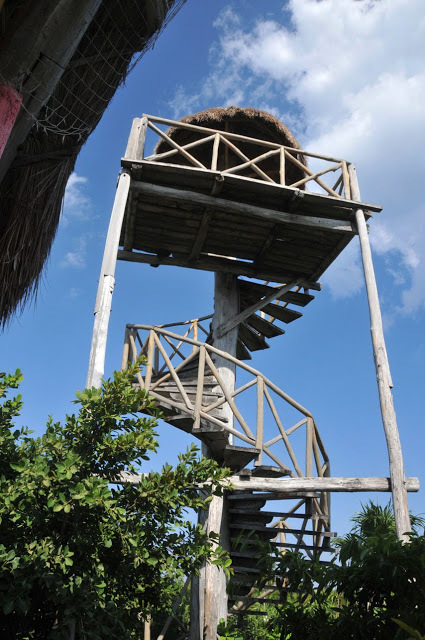 The Mayan complex of Tulum is among the best preserved archaeological sites and the third most visited one in Mexico (after Teotihuacan and Chichen Itza). 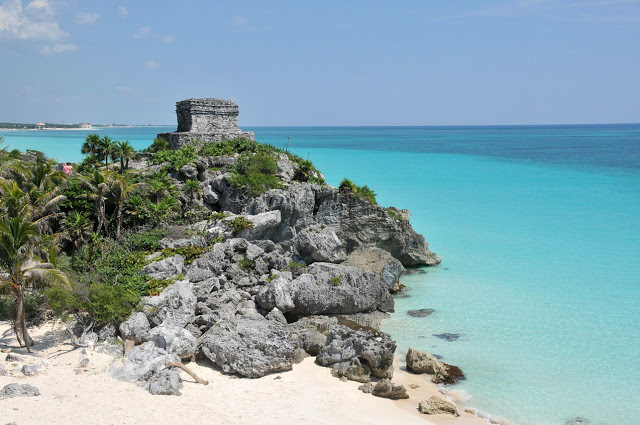 Some say the Tulum ruins are the most picturesque of all similar sites. Indeed, no other Mayan complex boasts a location as impressive, on the coast of the intensely blue Caribbean and equipped with its own beach. 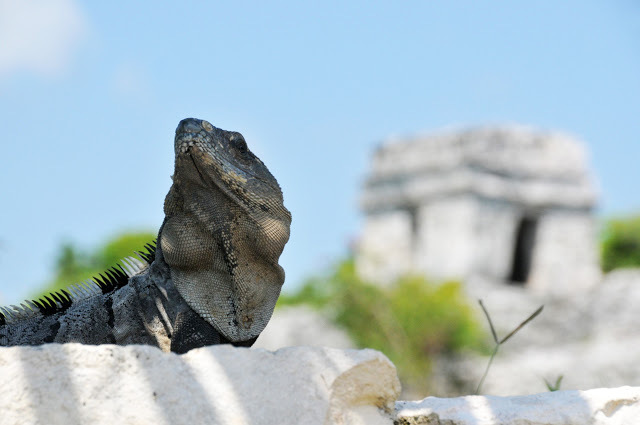 Numerous iguanas were strolling lazily around, visibly used to visitors and contributing to a most authentic Mexican experience. My next stop was the Si’an Kaan Biosphere Reserve, a natural park and one of Mexico’s UNESCO protected areas. 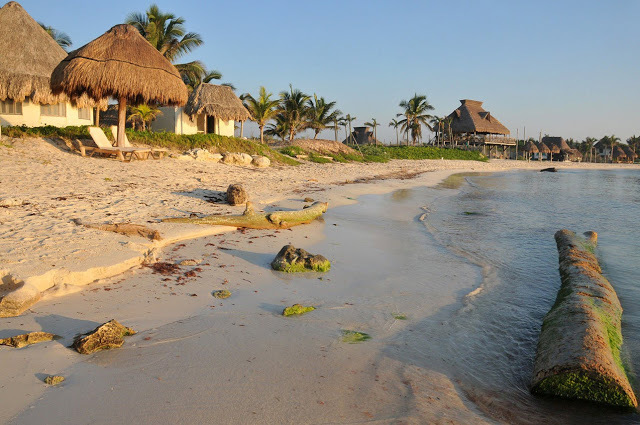 I must have cycled along a coastal road for a near hour to reach there from the Tulum ruins. Past the entrance to Si’an Kaan, the pavement gave way to a dirt road. And what dirt road! Every meter brought new surprise unevenness or a puddle. Thank goodness my hired bike – and its ultra thick tyres – were well designed for that. I eventually reached the visitor centre of the long-coveted Reserve and, for the absence of proper racks, locked the bike onto a tree. There was little need of locking anything in that place though; the empty “visitor centre” did not seem to be frequented much. 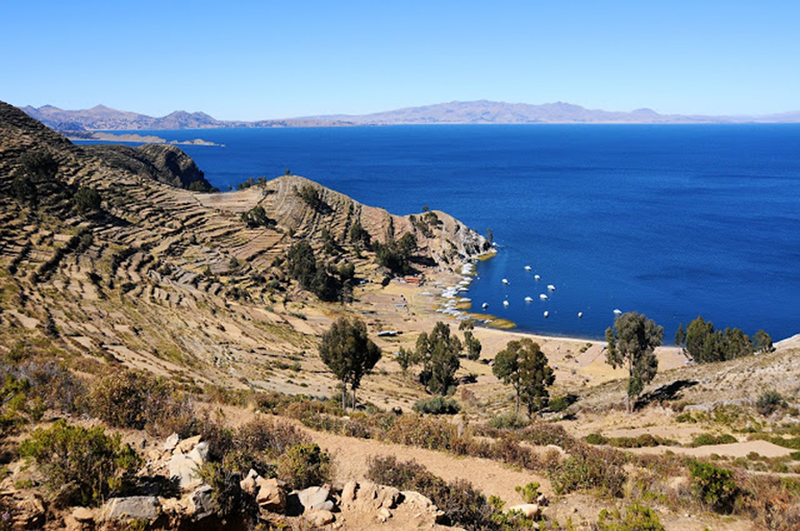 Perhaps I had arrived during the siesta – in the half an hour spent there, I saw no other human soul anywhere near. The sign-posted path led towards the Caapechen Lagoon, which, too, was unusually quiet for the marketing it received in the travel guides. The lonely information shield next to the water warned visitors against swimming, among other things. I looked at the water. It was pure idyll. Multiple fish were splashing loudly next to a few abandoned boats. I wondered why swimming was forbidden. 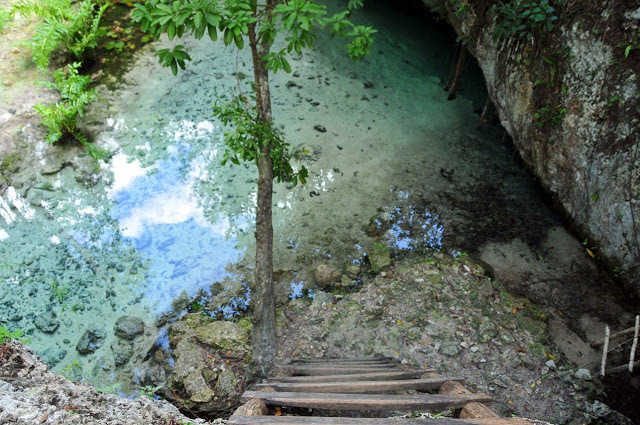 Why is it then allowed in Mexico’s other protected areas, such as the famous fresh water caves (“cenotes”) or near Cozumel’s coral reefs? The answer did not make itself wait for too long. It first emerged out of the water in front of my eyes – and then, just in case I was not yet convinced, swam right over. It was a crocodile. A real crocodile, the first one I had ever seen alive. Somehow I did not feel like swimming in that lagoon anymore. Instead, I gave the crocodile a crooked smile and rushed back into the mainland. Before leaving, I climbed the watch tower rising over the (dead silent) visitor centre. All around me for kilometres stretched the jungle. To the east was the Caribbean; to the west, the Caapechen Lagoon. The salt and the fresh water stretched far and looked almost like they merged on the horizon. 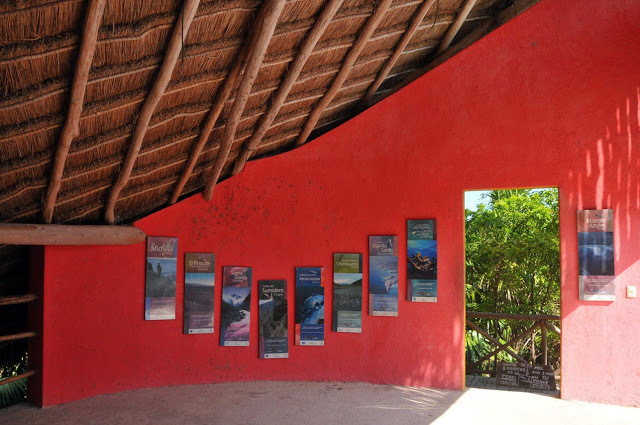 The Si’an Kaan Biosphere Reserve’s visitor centre. Hello? Back at the hotel, I had realised I was no longer alone; both other rooms were occupied. To my left, predictably, resided a couple (let’s admit it; I was in a honeymoon location). To my right was a more interesting case: a solo guy. I had assumed he was German. The only guys I ever met travelling unaccompanied are German. Oh, and there was once a Dane, but he later turned out to be visiting some friends, so I don’t count him anymore. I decided to wait till morning to find out. 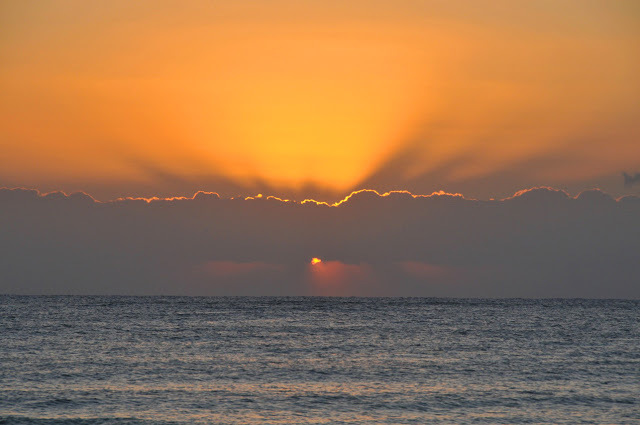 I woke up somewhat undecided about what to do and eventually settled for a day trip to Playa del Carmen and Cozumel. 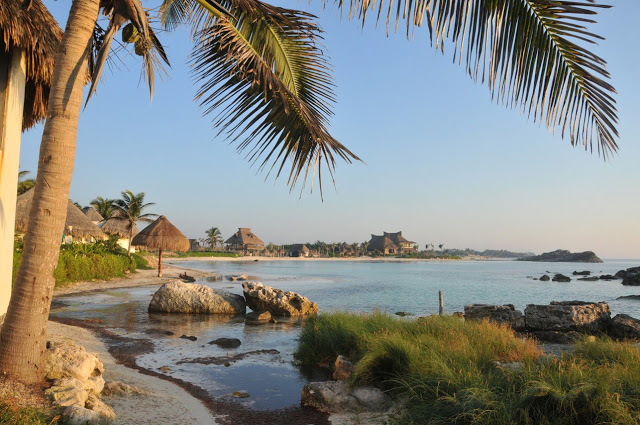 The former is a coastal town south of Cancun and a famously animated holiday location. 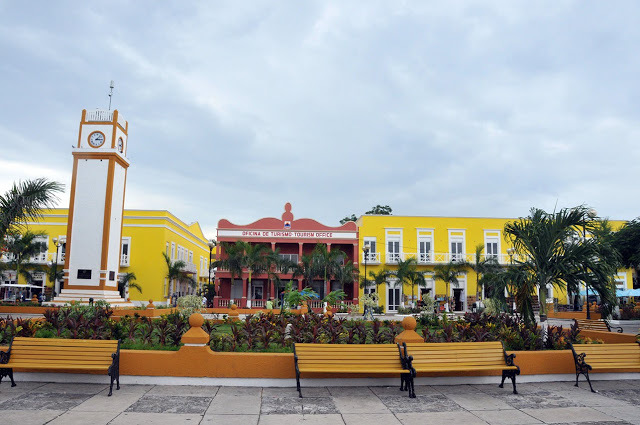 Cozumel is an island a 45-minute ferry ride east of Playa del Carmen, a tax-free zone much loved by countless cruise liners that stop there daily – and a world-famous diving spot. The sunrise was a perfect time for a beach walk. It was barely 7am, and the uniquely soft sunrise colours matched well with the subtle Caribbean blue. Occasional other early risers were walking past me with dogs and young children in tow. The new day had begun. By Tulum’s main intersection, I caught a van-like shuttle bus, better known locally as a “colectivo“. Colectivos are mini buses that run between locations frequented by locals on a hop-on, hop-off basis – operating a very efficient transfer service. Needless to say that the visitors benefit massively from colectivos for their convenience, speed comparable to regular bus services and very affordable fares. They are very similar to “marshrutka” minibuses back in the former Soviet Union, but operate over longer distances. 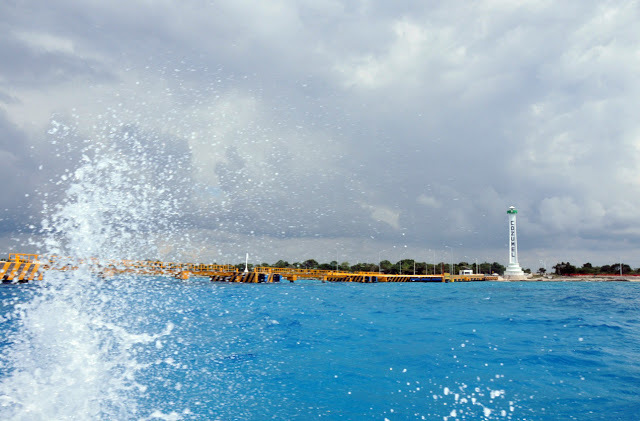 Playa del Carmen (locally known as simply Playa) is the main transfer point for the ferry to the island of Cozumel. The UK resident in me rushed to buy a return ticket, which I immediately came to regret. The route between Playa del Carmen and Cozumel is shared between two virtually identical competing ferry operators. A return ticket is priced simply by doubling the single fare, ties a passenger to that particular operator and halves the choice of available services. It was bad judgement from my side, but it was only my second day in Mexico. About a dozen snorkelling companies attacked the passengers disembarking on Cozumel. All were offering exactly the same prices and packages – the perfect competition paradise of every economist! I randomly chose one and embarked on a 2-hour snorkelling tour. After all, Cozumel is first and foremost famous for diving; the “best diving spot after Australia’s Great Barrier Reef”, many locals loudly boasted. Porfirio (the snorkelling instructor) and Alberto (the captain) did a fantastic job. We were taken to three of Cozumel’s numerous diving spots (Villa Blanca Wall, Paradise Reef and Las Palmas) and given just enough time to splash around in each. Initially sceptical about snorkelling (I seriously thought no equipment could ever help one to see better underwater), I finally tried it on and was thrilled. The multicolour, paradise fish in Cozumel’s waters was beyond this world! For the first time in my life, I wished I had a water-proof camera. The corals down below were likewise impressive, but perhaps more so to a real expert. And no, for my personal record, one cannot see underwater without a snorkel. Back on the shore, I noticed that the San Miguel city had been invaded by yet another cruise ship’s passengers. The place was swarming with souvenir and tax free designer shops; overall, Cozumel oozed commercialism. At least that meant that it had a Starbucks, too. I ordered my new favourite Vanilla Roiboos Chai Latte (don’t ask) and thought how nice it would be if every city in the world had a Starbucks. The world would have been a much better place then! My utopic thoughts were interrupted by drops of a sudden rain. Past the identical shops (hastily dragging their exposed merchandise indoors), I dashed for shelter. Finally I reached the zocalo (city’s main square) and hid under a tree. The minute I sat down, the central clock hit three and played “Cielito Lindo”, the song instantly associated with Mexico. I could still hear the catchy melody in my ears long after it had stopped. 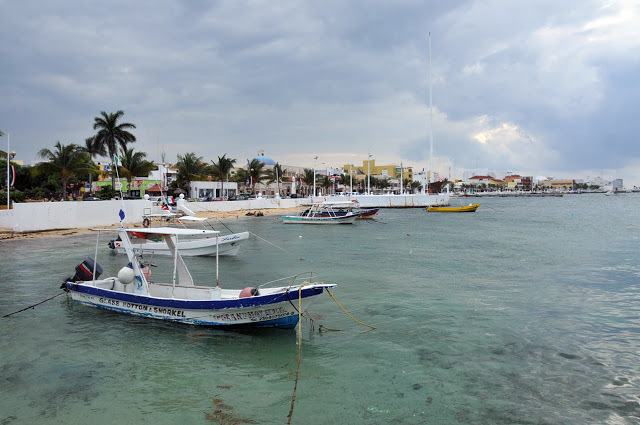 Cozumel is a relatively large island and has a lot more to offer a visitor than diving – but I did not have much time and headed for the 4pm ferry. On my way back, I spotted what looked like a Polish flag. Poland, here? I’d sooner expected to see one of Zimbabwe, admittedly. Just when I had almost convinced myself that the half-red, half-white cloth was an accidental combination of colours and not a flag at all, a man emerged next to me and offered a plastic bag to protect my camera from the rain. And by the way, it was a Polish flag I was looking at. His wife was Polish, and I was standing next to the entrance to their family bar. Would I like to have a look? And so amazed was I to have my Polish flag confirmed as such that it came as no further surprise that the young man was actually Czech. A native Czech living in Mexico with his Polish wife and running the Mexican Corona Sports Bar, much loved by the locals and visitors alike. Truly unpredictable are life’s ways sometimes. 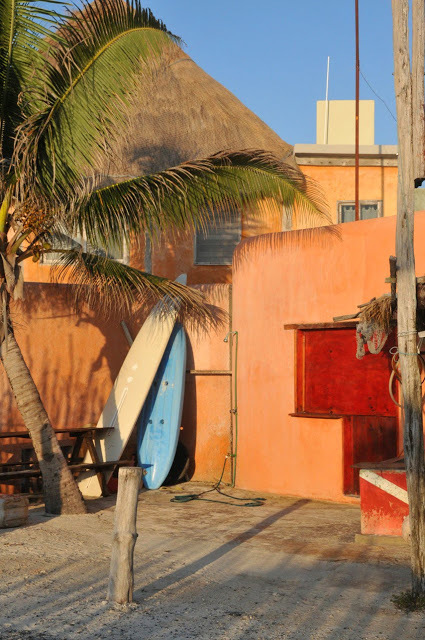 Radek (or Roger, as he preferred being called) had spent a few years in Mexico and was even beginning to look local. After a quick tour of the bar, out came a personal laptop. I was being shown the pictures of Roger and Agi (the mentioned Polish wife, predictably an Agnieszka) travelling around Mexico. They loved the tropics. Go back to the miserable winters we Eastern Europeans know so well? No, thanks. “And you know what”, Roger finally said with a strange look in his eyes. “Restaurant business is an escape. Everyone you will ever find in restaurant business has a problem with their family. A restaurant is just a replacement”. Perhaps that is why people from opposite sides of the world come to settle there. Back in Playa del Carmen, I walked the entire length of the main pedestrian street parallel to the sea. It looked like I made the right choice in Tulum; its northern counterpart looked a right cluster of consumerism in comparison. Shop owners were calling out from every corner; the competition among them was fierce but non-aggressive. Numerous “traditional Mexican eateries” decorated with stereotypical Mexican mascots were lining up the streets. That in-your-face Mexican look was a bit of overkill. 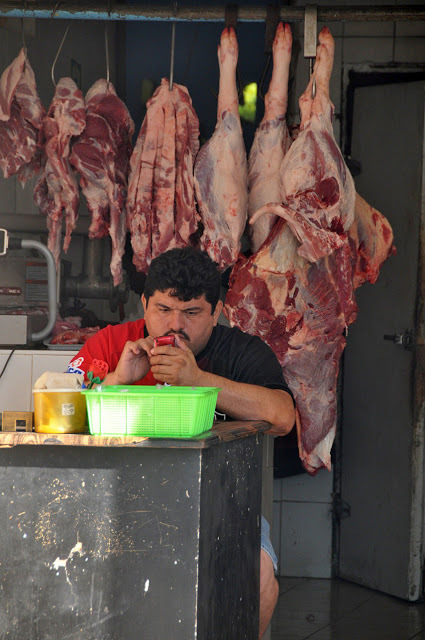 I could not stop thinking about a different kind of local life I had observed in Tulum earlier. The life of McDonalds, 7 Eleven and Coca Cola. The life we foreigners would not necessarily cliché as Mexican for it being so unexpectedly Americanised – yet the life inalienably local. As much as I claim to appreciate the “authentic local experience”, the pressure to see the horded, mass-tourism sites is sometimes difficult to withstand. 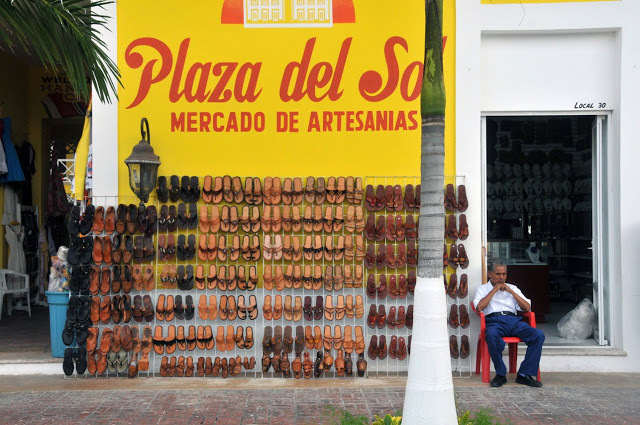 After my second Caribbean morning walk, I sighed and headed to Tulum’s bus station. Waiting for me was a day trip to Chichen Itza. 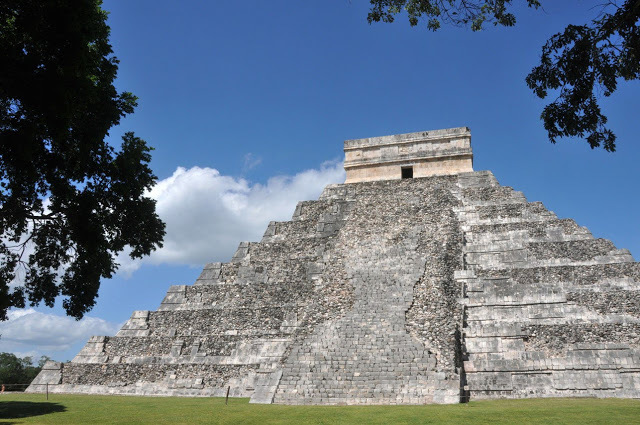 Where else but the much praised, tour bus besieged Chichen Itza, Mexico’s most celebrated Mayan site and one of the much debated New Wonders of the World? 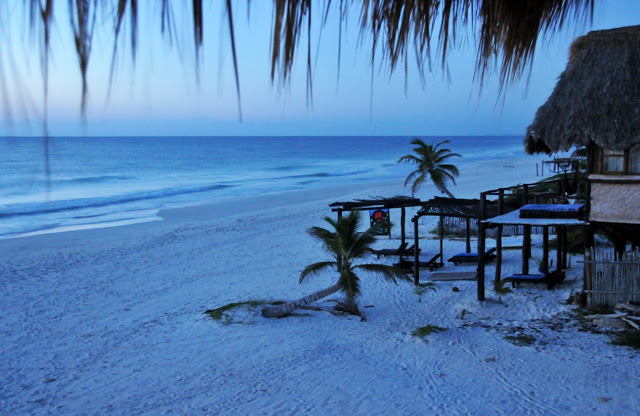 It is situated only 150 km from Tulum, and to miss it would be a serious crime. As much as I wasn’t looking forward to competing with busloads of other visitors for that unique Mayan experience. Perhaps the absent-mindedness of an inexperienced traveller was to blame for what happened next. I had a few minutes to spare before the bus and decided to report my Mexican whereabouts to my bank in London. I really should have done this before going; there have been occasions when my electronic payment cards were blocked because the bank had assumed they’d been lost and taken overseas for a massive shopping spree. Anyway, to my best knowledge, the cards were not yet blocked but some preventive measures wouldn’t hurt. I took out my phone and reached for my three cards. At the back of each card is a phone number for my bank. I never seem to memorise it correctly. I took out my three cards. Except there were only two in my purse. Huh? In vain I searched through every compartment and banknote. My most used card – the only debit card I own – wasn’t there. Of course it wasn’t there. Because it was inside that darn ATM I used on the way to the bus station. Yes, for the first time in my life I had forgotten a card inside an ATM. How much more stupid was I going to get that morning? I rushed back to the ATM. It was indoors and adjacent to a customer area of the same bank. The bank was shortly opening, and a queue of waiting locals was outside. “Mi tarjeta!” I screamed. “My card is inside! My bus is leaving! I need to get in first”. I then almost jumped on the flimsy glass door and shook it. The queue silently watched me break every known rule of publicly acceptable behaviour. The policemen was leaning against the wall next to us all but did not seem the least bit concerned. Perhaps he’d seen it all before. “It will be fine” a young man in the queue finally said, in remarkably good English “the machine started beeping after you rushed out. It must have swallowed the card, and they” he pointed at the glass door “should get it out for you”. At this stage, the door gave in to my persistent siege and flew open. I rushed to the first lady and showered her in broken Spanish. She patiently listened and shrugged her shoulders. “Mañana”, she said indifferently. “Mañana someone will come to unlock the machine and get all the stuck cards out”. Will she be here tomorrow? She shrugged again. She didn’t know. 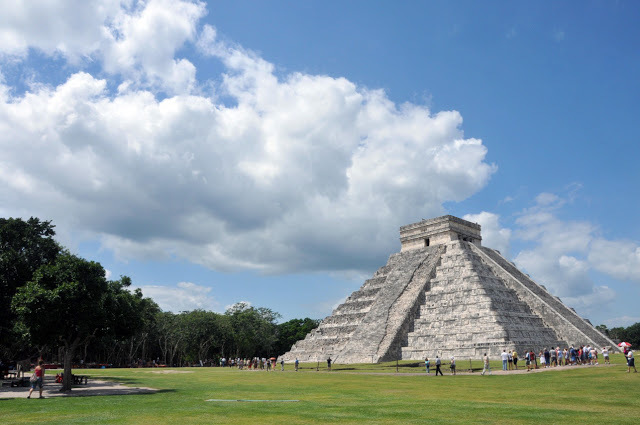 It wasn’t looking too promising, and I was better off put inside a bus to Chichen Itza to avoid further trouble. On the way back to the bus station, I called my bank and got them to block my debit card until further notice. Mañana. I finally arrived at Chichen Itza and joined the masses of people already making their way around in the +30 C heat. The guides-to-be were calling out from every direction. One of them spoke better Russian than myself! 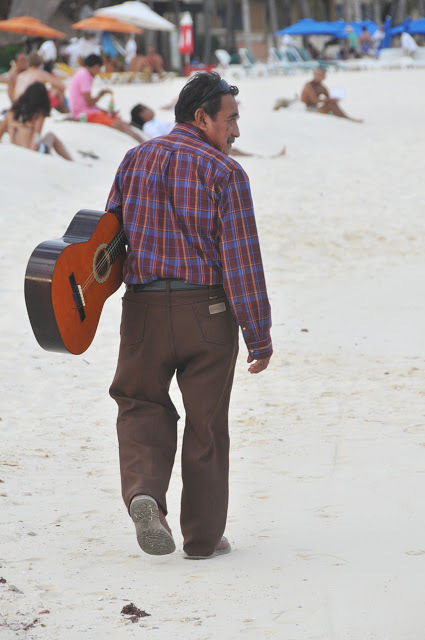 I wanted to ask him if he was from Cuba (like my Spanish teacher in Riga, also a fluent Russian speaker), but he had already picked up a group of Russian tourists and was leading them towards the Temple of Kukulkan. I quietly followed. I spent three hours wandering around Chichen Itza. The sheer area of the complex was impressive, with numerous ancient structures – each formerly serving its special purpose – rising among the trees. 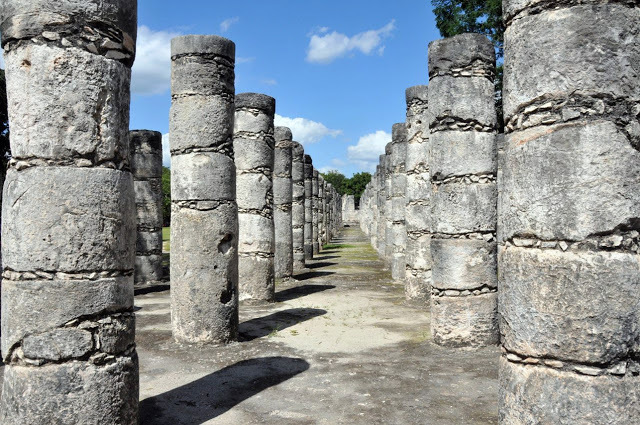 Chichen Itza may be overcrowded with tourists and commercially minded locals – and, disappointingly, has recently closed its monuments to public access – but its cultural heritage is undebatable. I would definitely recommend a day visit. The road to Chichen Itza was unexpectedly interesting, too. We passed numerous small roadside settlements, an invaluable insight into everyday provincial Mexican life. Women were washing clothes outdoors using an old-school combination of buckets full of water and bath tubs. Children were peeping curiously at the passing bus from doorsteps and windows. Some people were haggling at roadside vegetable markets; others selling handicrafts in the street. The place which fell into my mind in particular though was Valladolid. Located about 100 km from Tulum and 50 km from Chichen Itza, it would have made a perfect stopover for someone with their own transport. The town looked wonderfully authentic and not the least bit entertained by tourists. It was simply perfect. I promised myself to come back one day. The sea was raging through the night. 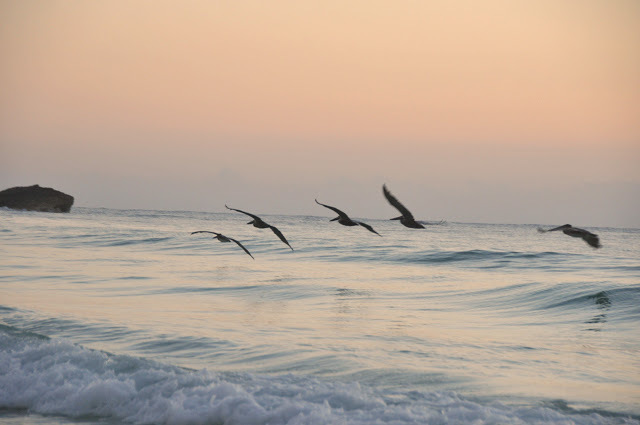 I got up around 5am and took my final pictures of the sunrise in Tulum, one of the best on my memory. 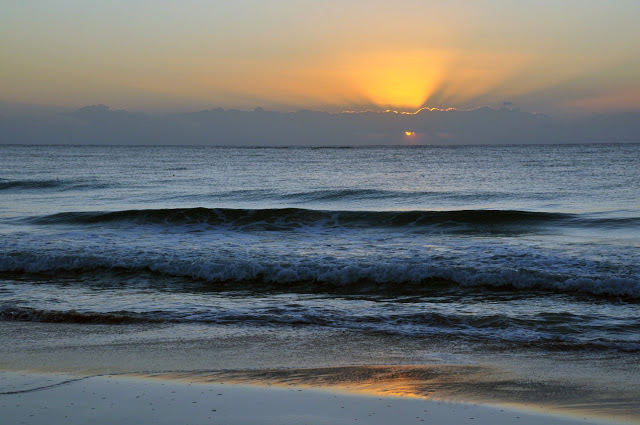 The pastel colours of the Caribbean made a perfect canvas for the bright rays of the morning sun. It is just one of those views one can never get enough of. I had the full day to spare before my night bus to Palenque. After picking up a bicycle to rent (at a 20 peso discount to last time, as I was already a “regular”), I headed lazily to 7 Eleven for my morning coffee. Proper Mexican coffee is good and all that, but my heart stubbornly resides with that coffee-like, inauthentic brew they make in the Western world. My next stop was Grand Cenote, situated about 3km from Tulum along the highway to Coba. Cenotes are sinkholes containing groundwater and are widespread on the Yucatan peninsula. A local explained to me that cenotes come in two types: more resembling underground caves and, literally, holes in the ground. Both are filled with fresh water and usually open to the public for swimming. 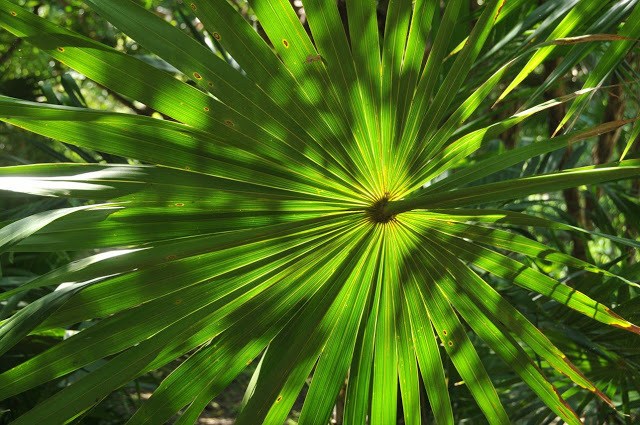 Tulum has the largest concentration of cenotes in Mexico; the most famous one among the visitors is Grand Cenote. The cave did not look particularly big from above. As I entered, however, it opened up several wonderfully mysterious grottos, the largest one a few meters long and leading to cenote’s second opening overground. Stalactites were hanging from the vaults and small bats were scaring visitors by their occasional appearance above the water. In quite a colony were their black little bodies hiding in the darkness closely overhead. I hired a snorkel and peeped underwater. There existed yet another world. The world of small colourless fish (compared to the bright Caribbean, anyway), not the least bit afraid of human divers. The world of stalagmites and rich submarine flora. 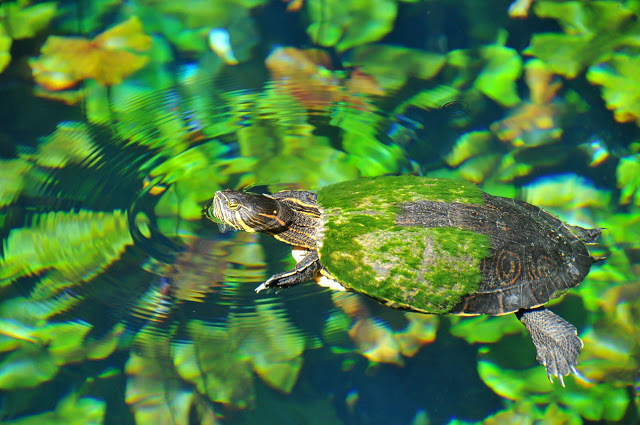 Most of all, the world of Miss Turtle. It seemed to be Grand Cenote’s most famous permanent resident, greeted amicably by the staff when it stuck its head out of the water. After reluctantly parting with Grand Cenote (and Miss Turtle), I spent a while cycling around Tulum and chatting with random locals. The most memorable one was Fernando the Alchemist. Or Fernando the Herbal Shop Owner, rather. He spotted my violently mosquito-harassed limbs and offered a look at his shop for some repellent. Fernando was certainly an interesting type. Having heard where I was going next, he nodded approvingly. “Palenque! Make sure to try the mushrooms”. Really, mushrooms? I was not aware mushrooms were Palenque’s national dish. “Oh, come on”, Fernando said sympathetically. “Psychedelic mushrooms. 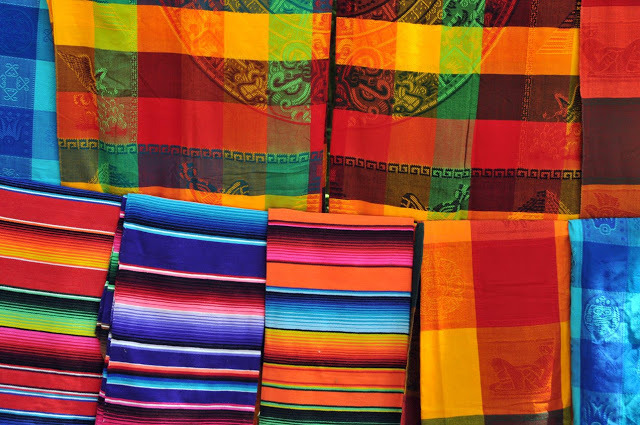 You can buy them anywhere in Palenque. Naturalmente”. Not sure if psychedelic mushrooms were exactly the kind of “local delicacy” I was looking for, in Palenque (or indeed any other part of the world), I politely thanked Fernando and continued my cycling journey. And my debit card? It was still buried in that God-forsaken ATM opposite the bus station. The clock stroke 2pm, and I figured whoever was unearthing it had had enough time. The girl I had spoken to the day before looked at me apologetically. The man who was supposed to unlock the machine didn’t turn up in the end. “Mañana”, perhaps. Or the day after tomorrow. Whoever that man was, he was certainly enjoying great flexibility of working hours – or working days, even. I sighed and called HSBC to annul my card irreversibly. Bye-bye, debit card. I’ll be smarter not to forget it next time. Especially 8,000 km from home! That I didn’t know. Thankfully so! There are around 5km from my beachside hotel to the bus station. With my backpack and all, I decided to start walking in the right direction, and a taxi would inevitably pass by and tout me in. Dozens of taxis always seemed to be sneaking past whenever I was walking along that road. Not this time, though. Most ironically, the taxis always seem to be bothering you when you’re a happy walker – but are never there when you actually need them. 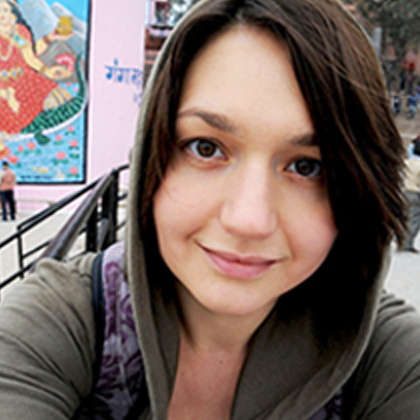 I had walked around a kilometre when a private car stopped suddenly beside me. A girl’s head popped out of the window; “Need a ride?” she said. A married couple, Naicel and Moises were originally from Venezuela. Interrupting each other, they complained loudly about the state of their home country. “It is much better living in Mexico”. Many thanks for the ride! It was already getting dark when my bus left Tulum, heading south. I was lucky to be sitting alone for the first 40 minutes, when an obvious foreigner twice my size waved his ticket and pointed at a seat beside me. Damn it. Was there really nowhere else to sit? Judging by the face of my neighbour-to-be and the amused looks of the front half of the bus, I must have put my thoughts into words. The outraged foreigner gave me a theatrical speech in broken Spanish, finishing in “que tipa”. Whatever. I hope I was not expected to get excited about spending a night side by side with a complete stranger. A male stranger. A male stranger with a big stomach and Travolta hair a-la Grease. Oh well. By the time we reached Escarcega, I had had enough of the unsolicited companionship and fled to the back of the bus. The curves of the road were felt a lot stronger there, but at least I didn’t have to curl up in a single seat next to a complete stranger. I sighed and prayed that the remaining five hours may pass quickly.